ci design recently completed a 200,000 square foot interior renovation for ARRIS, a global innovator in IP, video, and broadband technology. This project included corporate office, amenity and support spaces, in addition static-sensitive computer and programming labs and testing facilities. ARRIS has cultivated a strong global brand identity, and the new fit-out needed to reflect their core. The design of the facility was based on ARRIS’ corporate branding guidelines and colors, and was inspired by the sleek products they manufacture. To this effect, ci design established a clean and modern aesthetic, and utilized the branding palette to differentiate particular areas within the program. Orange and gray, ARRIS’s main company colors, were set as accents for spaces that welcome visitors, such as lobbies and customer conference rooms. 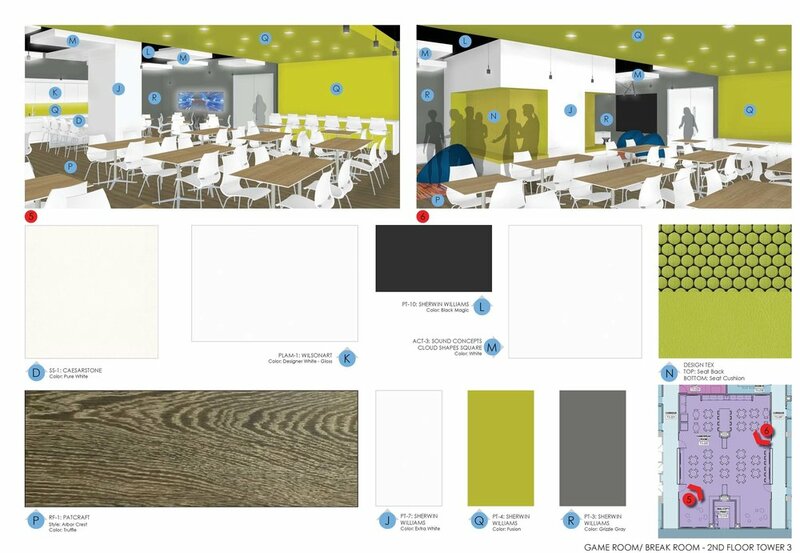 Green and charcoal highlight all areas where employees interact, such as informal meeting areas and break rooms. The primary program drivers in this project were the laboratories and technology testing rooms, with offices and other spaces providing the necessary infrastructure. For the Workplace Strategy, the team determined that clustering support spaces around the labs would reinforce ARRIS workflow and fluid environment. The existing building was organized into three interconnected towers with limited floor plates, and ci design was able to provide the programmatic adjacencies established by the Workplace Strategy. Life at ARRIS is highly interactive, and the 1,800 square foot employee break/game room was designed to be the office epicenter and bring ARRIS employees together. Vibrant colors and contemporary dining furniture create an atmosphere that reinforces ARRIS’ culture and branding. Since occupancy, the break/game room has become a popular zone for both relaxation and work, achieving the objective established by ARRIS.